Hello Sofia i Sofia, Bulgarien : Boka nu! 100% charge for no show and cancellation for groups. All the Studios & Apartments offered are located in downtown on different addresses, near the guesthouse. Group reservations/8+ Pers/ are possible, but before booking please contact us to discuss options and conditions in advance. For additional information send us email or call. Our guest bedrooms have been individually furnished and tastefully decorated to the highest standard. 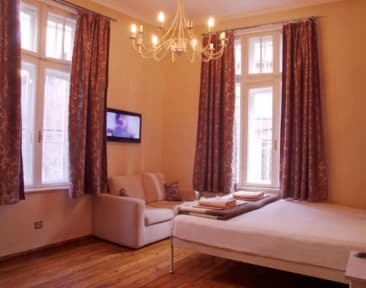 Hello Sofia en-suite rooms are equipped with all natural linens, blankets, pillows and furniture and equal to 3 star hotel rooms. Guests are welcome to use the kitchen facilities, free WiFi and HDTV's . Your friendly host Marin and his staff are waiting to welcome you to Hello Sofia, greeting all guests with a complimentary tea or coffee on arrival and they will be happy to share their local knowledge with you and assist with information about Sofia. Please pay attention that all reservations are kept no longer than 3 hours after given time. Please call us if you late to keep the room. We need your arrival time by email or phone. * Standard check-in begin after 13:00h until 20:00h. Inform us ASAP if you're coming outside/after this time period to confirm the accommodation possibility and additional charges. Cancellations or changes your booking: at least 7 days before arrival date by phone or email for confirmation. We accept payment in cash only: Euro or Bulgarian Leva on rate 1.00 Euro 2.00 Bulgarian Leva. The total amount is payable on arrival.